Pioneers in the industry, we offer concrete pump hose and concrete delivery hose from India. 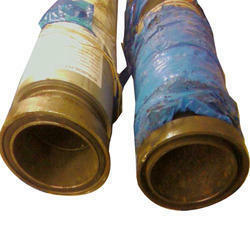 We are a leading suppliers engaged in providing a vast range of Concrete Pump Hose. 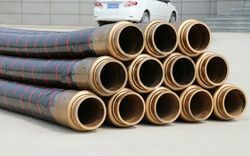 The concrete pump hose is used for joining the pump to the outlet of machines and transporting concrete with the help of pumps. It is ideal for moving the erosive viscous fluid or liquid like cement, sand, plaster etc. The shape of concrete end hose ensures a good grip. Crush-proof nickel-plated couplings for a secure and hassle-free fit, are constituted in these hoses. The reinforcement of the concrete pump hose or end hose is done with synthetic cord spirals. The surface is with wear resistant rubber that provides resistance against abrasion, climate and chemicals. We are engaged in manufacturing, supplying and exporting supreme quality Concrete Delivery Hose. The high-grade raw material is sourced from the reliable vendors of the market using superior quality raw material, which is sourced from the most reliable vendors of the market. Moreover, the hoses offered by us are available in various specifications that help in meeting the diverse requirements of our clients.